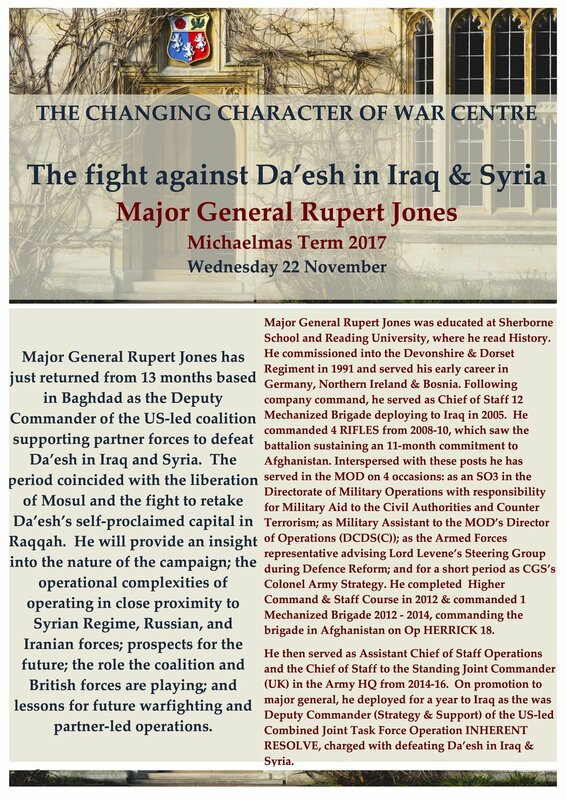 Major General Rupert Jones has just returned from 13 months based in Baghdad as the Deputy Commander of the US-led coalition supporting partner forces to defeat Da’esh in Iraq and Syria. The period coincided with the liberation of Mosul and the fight to retake Da’esh’s self-proclaimed capital in Raqqah. He will provide an insight into the nature of the campaign; the operational complexities of operating in close proximity to Syrian Regime, Russian, and Iranian forces; prospects for the future; the role the coalition and British forces are playing; and lessons for future warfighting and partner-led operations. Major General Rupert Jones CBE was educated at Sherborne School and Reading University, where he read History. He commissioned into the Devonshire and Dorset Regiment in 1991 and served his early career in Germany, Northern Ireland and Bosnia. Following company command, he served as Chief of Staff 12 Mechanized Brigade deploying to Iraq in 2005. He commanded 4 RIFLES from 2008-10, which saw the battalion sustaining an 11-month commitment to Afghanistan. Interspersed with these posts he has served in the MOD on 4 occasions: as an SO3 in the Directorate of Military Operations with responsibility for Military Aid to the Civil Authorities and Counter Terrorism; as Military Assistant to the MOD’s Director of Operations (DCDS(C)); as the Armed Forces representative advising Lord Levene’s Steering Group during Defence Reform; and for a short period as CGS’s Colonel Army Strategy. He completed the Higher Command and Staff Course in 2012 and commanded 1 Mechanized Brigade from 2012 to 2014, commanding the brigade in Afghanistan on Op HERRICK 18. He then served as the Assistant Chief of Staff Operations and the Chief of Staff to the Standing Joint Commander (UK) in the Army HQ from 2014 to 2016. On promotion to major general, he deployed for a year to Iraq as the was Deputy Commander (Strategy and Support) of the US-led Combined Joint Task Force – Operation INHERENT RESOLVE, charged with defeating Da’esh in Iraq and Syria. He is married with 3 children, aged from 17 to 13.